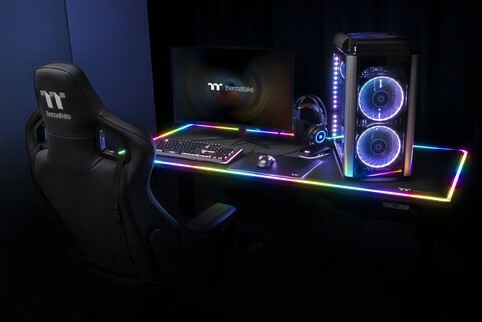 Las Vegas, United States －January 10th , 2019－Thermaltake, celebrates their 20th anniversary by announcing a new category addition to the Thermaltake Gaming lineup at CES 2019- the Level 20 RGB & Level 20 GT BattleStation Gaming Desks, located at the Venetian Hotel Veronese 2402 Suite from January 8th (Tue) to 11th (Fri). 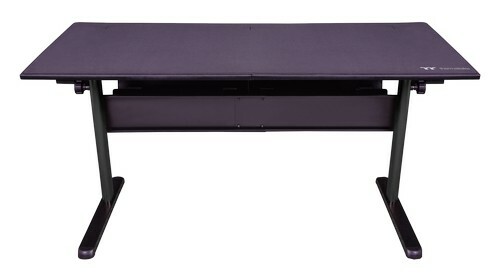 Designed with the needs of gamers in mind, the Level 20 RGB & Level 20 GT BattleStation Gaming Desks are built using the highest quality of materials, constructed with a thick and durable steel frame for enhanced stability, finished off with a special anti-scratch resistant coating for added durability, and style finished for that all-important sleek gaming aesthetic. 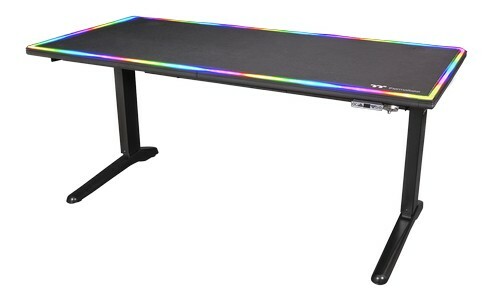 The Level 20 RGB BattleStation gaming desk is automatic height adjustable, fully compatible with the TT RGB PLUS ecosystem and features: 16.8 million RGB color illumination with 8 dynamic lightings effects and up to 20 customizable lighting zones for added personalization, 4 memory profile controller for easy saving and recall of height settings, large space design for maximum full tower chassis support, included full surface gaming desk mouse pad, and easy cable management system to keep your desktop looking neat and clean. The Level 20 GT BattleStation Gaming Desk features a manual adjustable design, and includes a large space design, full surface mouse pad, and cable management system. Enhance and elevate your game experience with the Level 20 RGB & Level 20 GT BattleStation Gaming Desk. 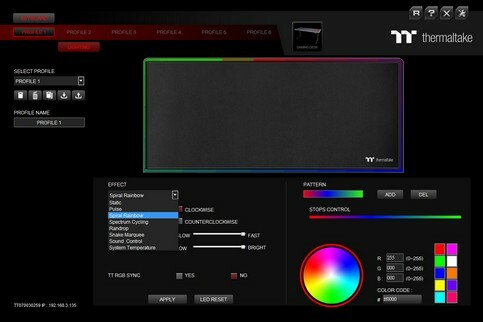 Personalize the Level 20 BattleStation RGB gaming desk with up to 8 stunning lighting effects: Static, Pulse, Spiral Rainbow, Spectrum Cycling, Raindrop, Snake, Sound Control, System Temperature and customize up to 20 zones via the TT Premium gaming software for added personalization of your BattleStation. Automatically adjustable design allows users to freely adjust desk height between 27.5 to 43.3 inches at 0.6 inches per second for smooth transition to different seat height positions up to standing to suit gaming needs. Comes equipped with 4 level height profile memory controller to store desired settings for convenient recall at any time. The full surface mouse pad included with the gaming desk comes in an optimized cloth surface design with semi-coarse textured weave for enhanced mouse tracking and balanced gameplay. 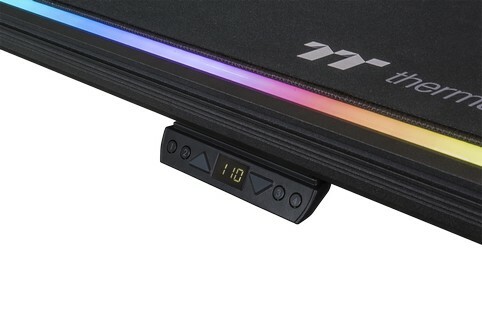 It is constructed with a solid sewing edge design as to ensure long-term durability, preventing peeling or warping of the mouse pad and uses a special anti-slip rubber base to prevent any slippage. In addition, it is readily removable for easy cleaning and maintenance. Keep your cables neat, tidy, and organized with the cable management tray system for clutter free performance of your desk. 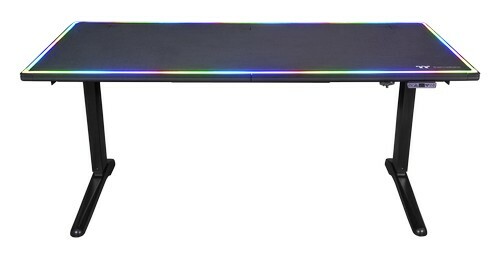 Measuring in at 64.9 x 29.5 x 27.5 inches, the Level 20 RGB BattleStation gaming desk offers full support for the majority of full tower chassis on the market and offers enough space for multi-monitor gaming setups, giving you the freedom of flexibility of how you want to personalize your setup. Using only the best materials, the Level 20 RGB BattleStation is constructed with a durable enhanced steel frame and features a desktop thickness of 1.18 inch for added stability. In addition, it is finished off with a special scratch and wear resistant powdered coating and can take a max load of 150kg for maximum durability and reliability. Compatible with TT RGB PLUS, TT SYNC, Amazon Alexa, and Razer Chroma for syncing and color coordination of your gaming station setup. 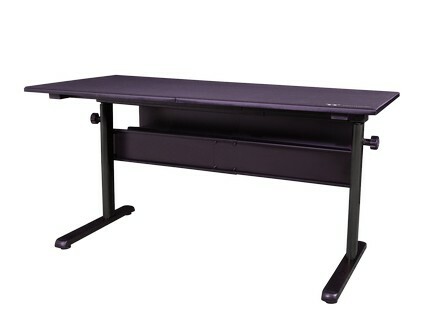 Adjustable manual design allows users to freely adjust desk height between 28.9 to 40.7 inches at 1.9 inch intervals for smooth transition to different seat height positions up to standing to suit gaming needs. Measuring in at 59 x 27.5 x 28.9 inches, the Level 20 GT BattleStation gaming desk offers full support for the majority of full tower chassis on the market and offers enough space for multi-monitor gaming setups, giving you the freedom of flexibility of how you want to personalize your setup. Using only the best materials, the Level 20 GT BattleStation is constructed with a durable enhanced steel frame and features a desktop thickness of 0.70 inch for added stability. In addition, it is finished off with a special scratch and wear resistant powdered coating and can take a max load of 100kg for maximum durability and reliability. The new Level 20 & Level 20 GT BattleStation gaming desk is now available for purchase, via the Thermaltake worldwide network of authorized retailers and distributors. The Level 20 & Level 20 GT BattleStation gaming desk is backed by a two-year warranty and supported by the Thermaltake worldwide customer service and technical support network. For up-to-date pricing of the new Level 20 RGB gaming keyboard, please refer to the Thermaltake website or contact your local Thermaltake sales or PR representative.